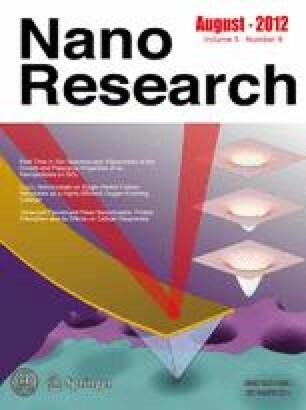 The evolution of the film thickness and plasmonic properties for sputtered deposited Au nanoparticles on SiO2 layers have been monitored in real time using in situ spectroscopic ellipsometry in the photon energy range 0.75–4.1 eV. The spectroscopic ellipsometry data were analyzed with an optical model in which the optical constants for the Au nanoparticles were parameterized by B-splines which simultaneously provide an accurate determination of an effective thickness and an effective dielectric function. The effective thickness is interpreted with support of transmission and scanning electron microscopy and Rutherford backscattering measurements. Further parameterization of the optical constants by physical oscillators in the isolated spherical particle region allows the microstructural parameters such as size and Au fraction to be extracted. Real time in situ monitoring allows the growth of nanoparticles from the nucleation phase to near percolation to be followed, and there is a red-shift of the plasmon resonance absorption peak as the nanoparticles increase in size and their interaction becomes stronger.